When it comes to lazing on the beach in luxury, White Sand Beach is one of the most popular destinations. 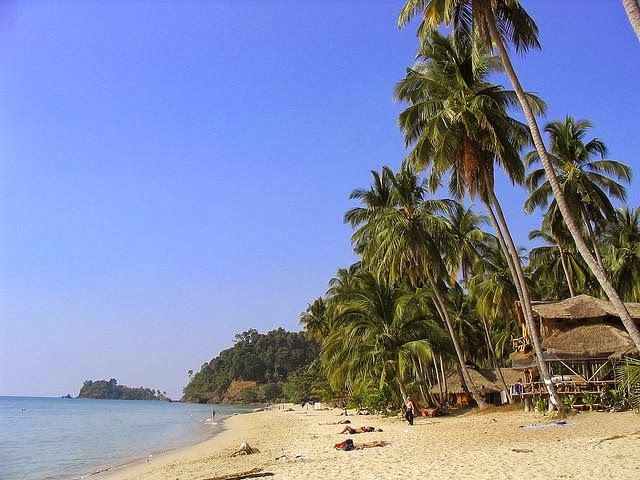 Located on the island’s northwestern corner, it’s the longest beach on Ko Chang. The central section of the soft sandy beach is lined with resorts and hotels. Hat Tha Nam on Ko Chang’s southwest coast attracts travelers looking for fun on a budget. From rustic bungalows to tree houses, visitors can find accommodations here on the cheap and spend the money that they’ve saved on the bars and restaurants popping up along the shoreline. Among the many beaches on Ko Chang, Hat Khlong Phao is one of the most striking. Extreme low and high tides make this picturesque beach a beachcomber’s dream. Located at the north end of the beach is Laem Chaiyachet, a rock formation that’s been fitted out with a pier. It’s the perfect spot to watch the sun setting into the Gulf of Thailand. Around 70 percent of Ko Chang is covered by mountainous forests, and taking hikes to view the island’s waterfalls offers visitors a refreshing break from sunbathing in the sand. A short hike from the beach of Khlong Phrao leads visitors to Namtok Khlong Phlu, the island’s largest waterfall. The falls drop in three cascading tiers. Those who climb to the top tier can reward themselves with a dip in a large pool.